I made another trip to the J.Crew Factory store this weekend to make a return and didn’t plan on trying much on. But a few dresses caught my eye, including the Short-Sleeve Basketweave Dress that Gigi’s Gone Shopping wrote about on her blog here so I decided I’d try them out. I tried a 12 and a 14 in this dress and the 14 had the better fit for me – again, allowing room for my hips. The top is a little loose, but not too bad, which is often the problem when I go up to a 14 in dresses – my hips have enough room but my top is swimming in it. This was a little loose up top, but manageable. I love how the dress has a clear waist definition and allows for my curves. AND – it hits at my knees! An issue I’ve had with Factory dresses the past few seasons is that they’re so short. This is completely work appropriate but is also a great dress for an evening out to a nice dinner or party. Big thumbs up for me. 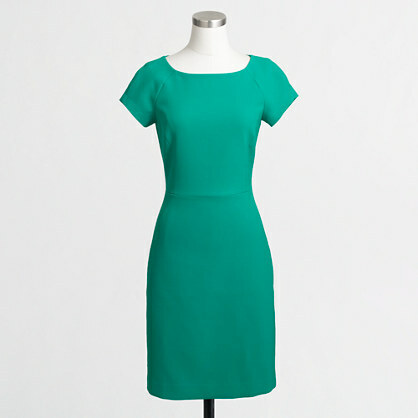 The next dress is the Crepe Short-Sleeve Dress in Bright Emerald. 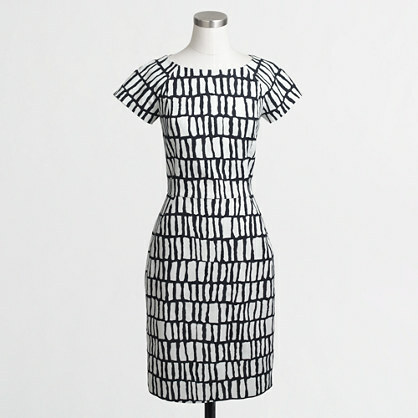 The color of this dress is what caught my eye and the shape looked very similar to the Basketweave dress. I tried a 12 and 14 in this dress as well and also felt more comfortable in the 14 in this dress. The material on this dress is weird. It’s a polyester/elastane blend and it bordered on feeling neoprene-ish but not quite the level of the neoprene items J.Crew released last year. It was almost scratchy. It wasn’t lined. 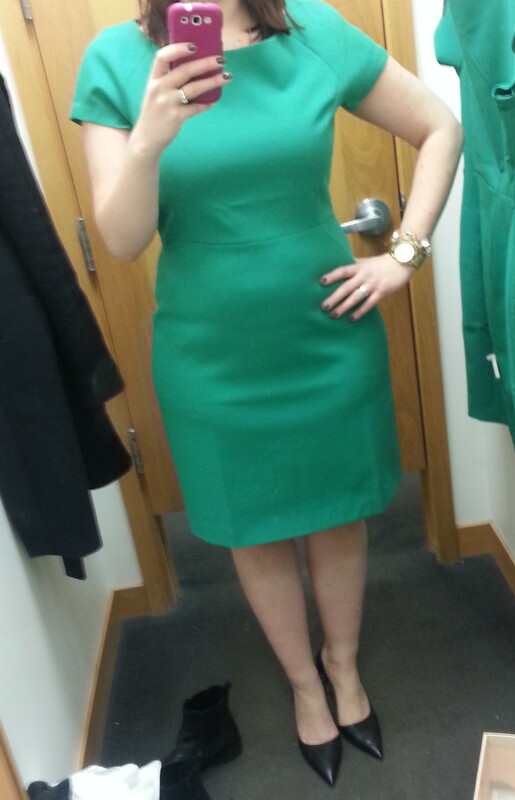 But I did really love the dress on, the shade of green is beautiful and it is a work appropriate length. The dress has stretch due to the elastane but this dress is anything but crepe feeling to me. J.Crew retail has done some decent polyester crepe in my opinion but this was just…weird. 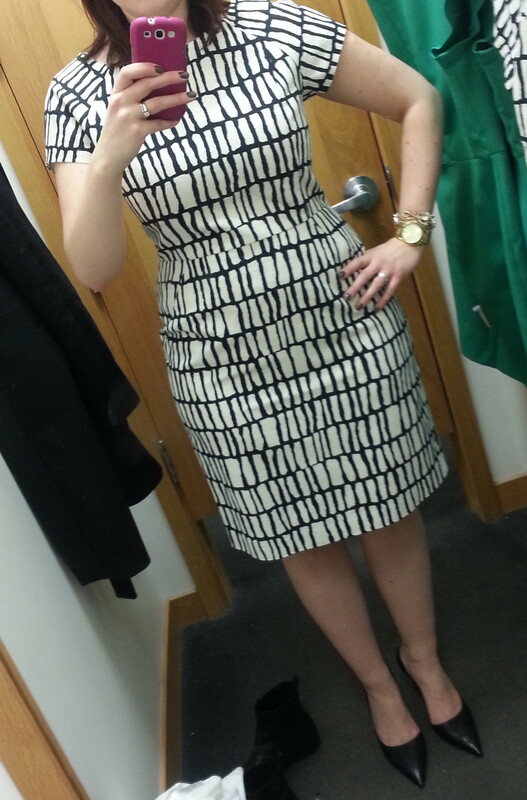 The dress was $108 – 40% off in store but I decided to only purchase the basketweave dress at this point. I can’t quite get over the weird fabric. The dress also comes in black. Even though the dress will probably have to sit in my closet for another month before it will see any action, I am glad I picked it up as it’s already out of stock in my size online. So, how about you? Have you tried either one of these dresses? Any other dresses you’re liking at Factory? I can only hope for more knee-length dresses this season! Would love to hear what you think and thanks for reading! I’m thinking of purchasing the bright emerald dress for my upcoming graduation. I’m 5’4 and weigh about 112 lbs and I’m thinking a size 2 would be good because I have wider hips and a booty 🙂 Did you feel like the top was baggy? (I see there’s quite a gap on your top). You also mentioned it was a bit scratchy..would you say pass on this dress? It’s on sale online for $64 right now so I can’t return it if I don’t like it. That’s why I want to be sure it’s something that I’ll like! I can’t try it on for myself so I thought I’d ask you your opinion! Thanks. Hi! Sorry, somehow I missed this comment in my queue! Thanks for reading. The top was a bit baggy on the dress, which you can see in the photo. I sized up for my hips but often take the sacrifice in the rest of the dress. The material is weird…it was an odd poly/elastane mix similar to the kick pleat mini that’s in stores right now. It was just a funny material, not scratchy but weird and stiff and I didn’t love it. If the material had been nicer I would have considered it!